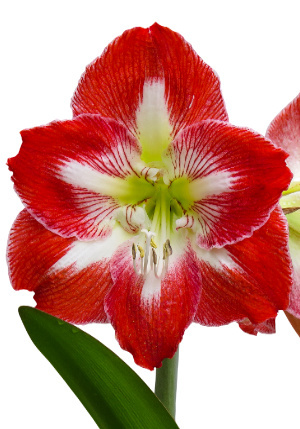 Amaryllis is a beautiful, large flower that accentuates any home decor. It is available in many different colors including pink, red, salmon, orange and white. Though it may be large, it is one of the easiest of all bulbs to grow and is almost foolproof. After your amaryllis blooms the first time, just follow a few easy steps to bring the wonderful blooms back year after year. Amaryllis bulbs come in several sizes. As a rule, larger bulbs produce more stems and flowers. 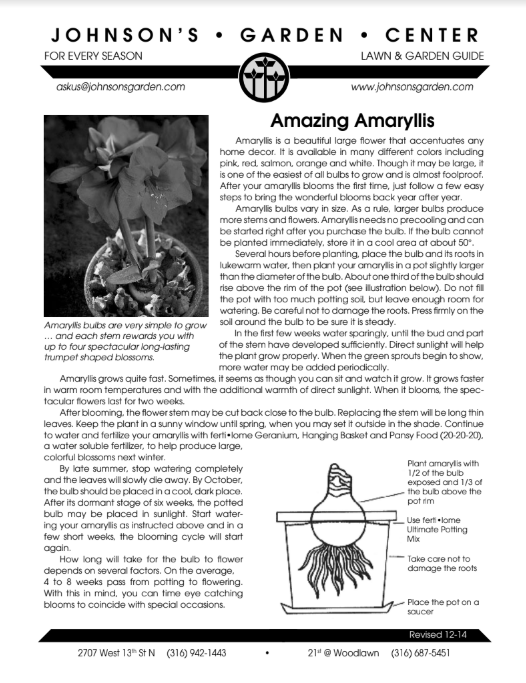 Amaryllis needs no precooling and can be started right after you purchase the bulb. If the bulb cannot be planted immediately, store it in a cool area at about 50 degrees. Several hours before planting, place the bulb and its roots in lukewarm water, then plant your amaryllis in a pot slightly larger than the diameter of the bulb. About one third of the bulb should rise above the rim of the pot. Do not fill the pot with too much potting soil, but leave enough room for watering. Be careful not to damage the roots. Press firmly on the soil around the bulb to be sure it is steady. In the first few weeks water sparingly, until the bud and part of the stem have developed sufficiently. Direct sunlight will help the plant grow properly. When the green sprouts begin to show, more water may be added periodically. Amaryllis grows quite fast. Sometimes, it seems as though you can sit and watch it grow. It grows faster in warm room temperatures and with the additional warmth of direct sunlight. When it blooms, the spectacular flowers last for two weeks. After blooming, the flower stem may be cut back close to the bulb. Replacing the stem will be long, thin leaves. Keep the plant in a sunny window until spring, when you may set it outside in the shade. Continue to water and fertilize your amaryllis with ferti•lome Geranium, Hanging Basket and Pansy Food (20-20-20), a water soluble fertilizer, to help produce large, colorful blossoms next winter. By late summer, stop watering completely and the leaves will slowly die away. By October, the bulb should be placed in a cool, dark place. After its dormant stage of six weeks, the potted bulb may be placed in sunlight. Start watering your amaryllis as instructed above and in a few short weeks, the blooming cycle will start again. How long will take for the bulb to flower depends on several factors. On the average, 4 to 8 weeks pass from potting to flowering. With this in mind, you can time eye catching blooms to coincide with special occasions.